"Uh, you wanna go where for lunch???" That's what I got from JuJu and RBC while we were suiting up for Sunday morning hockey. 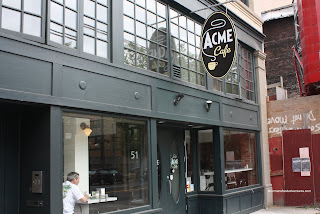 My suggestion of the Acme Cafe was both confounding and interesting all at the same time. When I gave the exact location, some nervous banter ensued. I assured them that it is a new restaurant and the area is evolving. Being the next block over from the new Woodward's development, it is obvious that there is indeed change happening in the neighbourhood. I remember a time when Hastings was the hub of activity. Not only was Woodward's still around, there was Golden Crown across the street. Back then, that was some of the best Dim Sum around out of Chinatown. That is now long gone, replaced by decrepit buildings and the occasional pub. Located near the old location of Save-on-Meats, Acme Cafe dares to go where some won't. 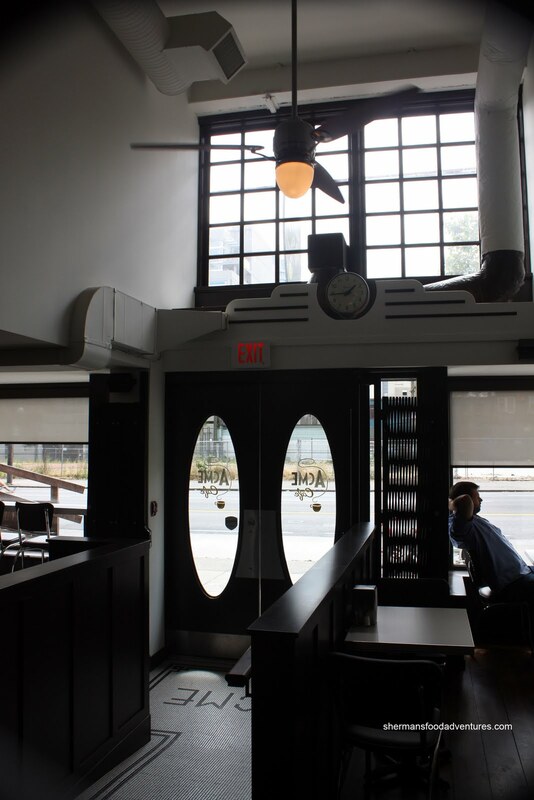 It attempts to bring the diner concept right into the heart of the Downtown Eastside. Once we got out of the Britannia ice rink, everyone decided to hop in my car. Oh okay, sacrifice the safety of my car eh? I guess it is a small price to pay since I did have 2 skeptical eating companions. The skepticism didn't stop there. We ended up parking near Tinseltown so that my car wouldn't be right in the middle of Hastings. Turns out that it would've been a better idea since it would've been directly across the street in plain view from Acme. You might be wondering why we were so cautious... Well, I did have all of my goalie gear in the car including 2 expensive sticks. Although, I'm not sure what anyone would want to do with my stinky gear. It's a built-in security device in itself! So when we finally entered Acme, JuJu and RBC were pleasantly surprised. 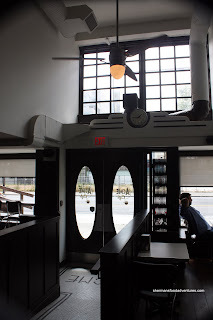 Complete with booth seating and a large counter, it certainly had elements of a diner with a modern touch. To their dismay, I insisted on sitting at the 3 window stools, although there were some prime seats at the counter. I had to explain that natural light would render better pictures. They didn't seem all that impressed. It also didn't help that the window seats were pretty darn hot. I'm truly blessed with patient and understanding friends! Without further ado, we ordered some drinks. RBC had the Chocolate Milkshake while I went for Vanilla. A tad on the watery side and not too sweet, we didn't mind the shakes. 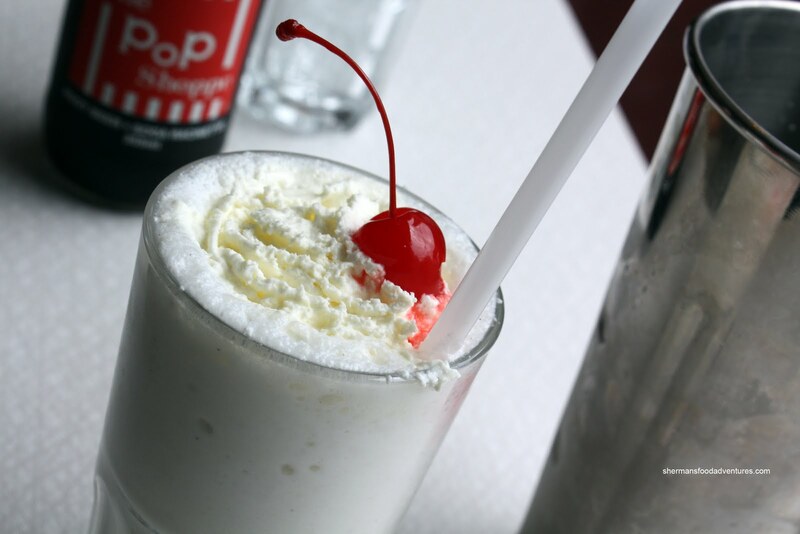 If you were looking for thick, sweet shakes, this may not be for you. A surprising blast from the past, JuJu ordered the Pop Shoppe Root Beer. I haven't seen one of these for a long time. 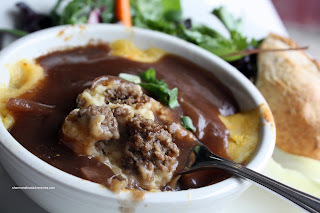 For my main, I went for the Crock Pot Supper Feature, which happened to be the Sheppard's Pie. When it arrived, it didn't look like much; but one spoonful revealed flavourful, tender beef with smooth whipped potatoes and a rich gravy. This was a very satisfying sheppard's pie, if not a tad on the salty side. 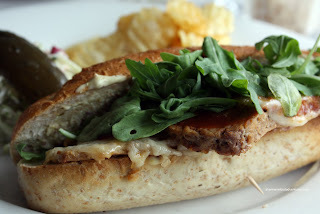 JuJu ended up with the Meat Loaf Sandwich. 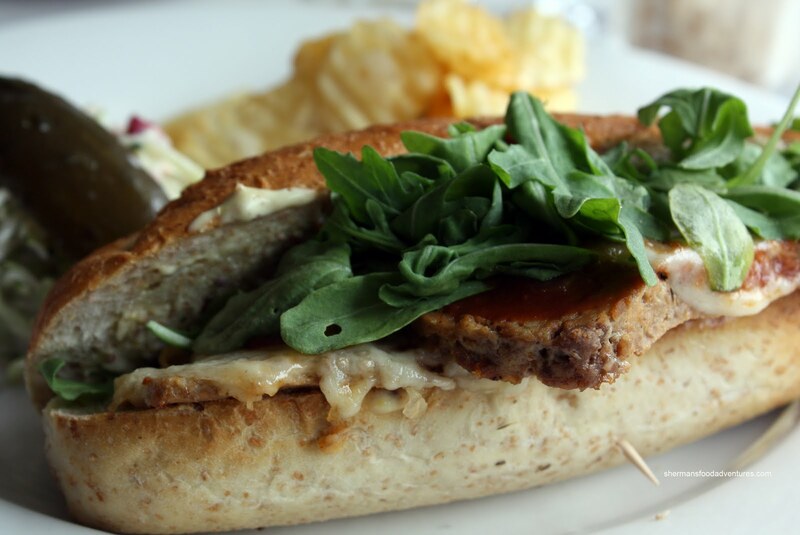 Wedged in between a whole wheat hoagie were 2 slices of soft mealoaf with caramelized onions, arugula, swiss cheese, grain dijon mayo and BBQ sauce. I gotta say that this sandwich is money (sorry for the Guy Fieri quote). The flavour really worked with a bit of smokiness from the BBQ sauce, tartness from the mayo, a splash of bitter from the arugula and sweetness from the onions. The only thing I'd change would be the bun. It reminds me of the old Tim Horton's bun which is a bit dense. When you try to chew through, everything shifts or falls out. JuJu and I couldn't resist and got a side of Mac 'n Cheese as well. We both agreed that it was pretty darn good. 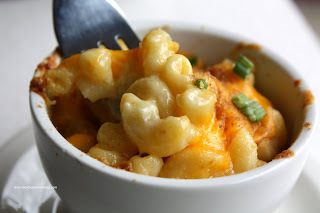 It was extremely smooth and cheesy without being salty. Moreover, the macaroni didn't degrade, maintaining its shape and texture. I didn't finish mine and packed it up. My son ended up eating it; therefore, it must've been good (he hates everything). RBC opted for the Chicken Club and as you can see, there are some quality ingredients at work. 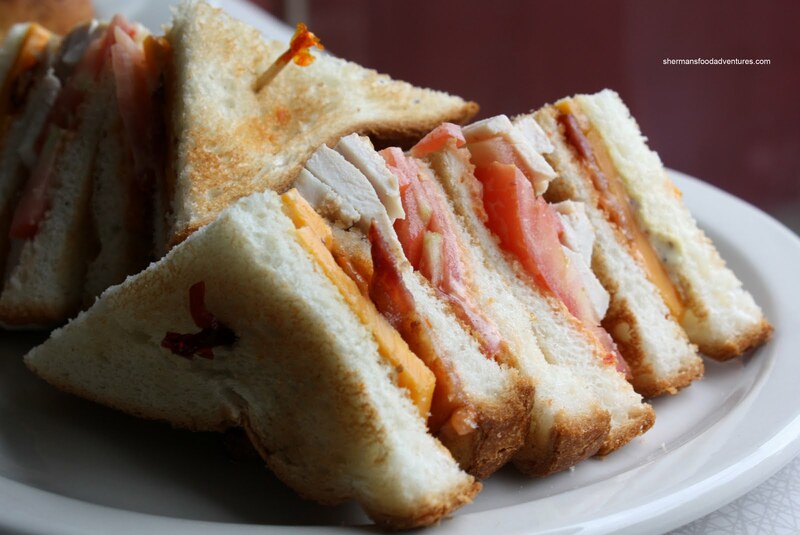 Real sliced turkey, cheddar cheese, bacon and fresh tomatoes made for a solid sandwich. We were quite impressed with their take on diner food. I found the prices to be fair, if not a tad on the higher side. It is evident there is a level of care and effort put into everything they serve. Of course it ain't mind-blowing food and it really isn't meant to be either. However, it is very solid eats presented in a retro environment. Coupled with personable service, it certainly was a pleasant surprise in a unusual location. No, your pictures are better... LOL... Yah, no hurry. Nothing earth-shattering to experience. I think they used sliced bread because it was a typical clubhouse, except with quality ingredients. The slice bread didn't bother RBC. However, we found out that the chips are from Costco (although, they are the really good kettle chips). They might want to look into making house-made chips; but I don't think they have the facilities for it. Sherman here is a great article that I might use in my Business classes about Pop Shoppe's revival.